You ever had that moment when you realise you’ve forgotten a friend’s birthday? Yep, think this has happened to me more than once! So this next card is going into my stash for when I forget again! I used a rather contrite looking pig from a stamp set I received from a friend of mine in the mail the other day. It came without any brand details so sorry I can’t tell you who made it. I coloured him in with my Stampin Up Blends and added a sentiment I created on my computer. I kept it simple following the sketch challenge at Freshly Made Sketches and used the key word from CASology of Late to inspire my design. Thanks for looking and I hope you never forget a birthday but if you do, maybe I’ve inspired you! In previous posts I mentioned that I’m taking a break from coffee. I’m trying to kick sugar and I worked out I was having 4 coffees a day with 2 sugars in each which meant 8 teaspoons of sugar a day – clearly not a good thing. It’s been tough and to compound my pain all I seem to be doing is playing along with challenges that focus on coffee – sucker for punishment I say! 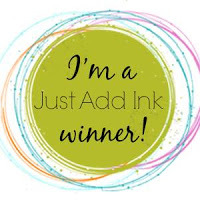 All items on my card are from Stampin Up – Coffee Cafe stamp set, Early Espresso ink, Petal Passion DSP, Linen thread and Whisper White cardstock. Using the ink and the DSP I sponged an ombre effect for the background piece, stamped and die cut the coffee cup then added it to my base with some dimensionals and linen thread for the final touch. SUO Challenge 192: Fun With Just One Color! Coffee Loving Cardmakers – Cuppa Joe! 2 more detox weeks to go then I’m going to try some coffee without sugar – wish me luck. Today’s card is brought to you via the Tic Tac Toe #031 Challenge. For my card I chose the middle line of Red/Ribbon/Watercolour. I stamped the Peony Garden background stamp from the Ton and heat embossed it with Stampin Up Iridescent Ice embossing powder. I then used some Brushos is brilliant red and leaf green to water-colour the main flower . The sentiment is from Altenew Label Love which I popped up on some dimensions and added a bow to the side for some balance. I really like how this card turned out and it is super super sparkly in real life. Check out this close up.